“Bridget, hurry up! You’re going to miss the bus!”. This is me every weekday morning. Why is it such a struggle to get kids up and out the door to school? My daughter is a little night owl and hates getting up early. Even when she is up, she takes her sweet time dawdling doing her everyday tasks to get ready for the day. It’s frustrating! Moms and dads, can you relate? I know I’m not the only one who deals with stressful mornings. I’ve chatted with friends and they tell they experience the exact same thing. I’m determined this year will be different. I may not make my daughter a morning person, but there a few simple back to school hacks I can do to make mornings as stress-free as possible. The good news is that you will only need a few everyday items to try them, too! Let’s face, kids are forgetful. If I’m being entirely honest, I’m forgetful, too. We’re human. Being in a rush in the mornings amplifies forgetfulness. I can’t tell you how many times I had to drive my daughter’s lunch to school last year because she forgets to bring it. Even though I’ll set it out on the kitchen counter that she has to pass on by to head out the door, it’s like she can’t see it. I’ll realize an hour later that it’s still sitting there. Oops! A Don’t Forget List can help. 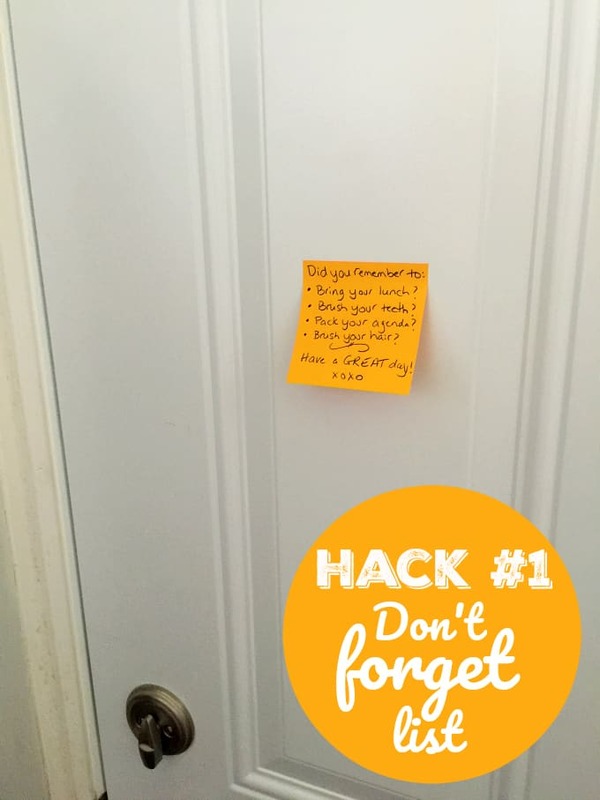 I used a 3×3 Post-it® with a list of important reminders on it and placed it on the door. This way, Bridget will see it on her way out and if she did forget something, she can run back and grab it before the bus arrives. For my list, I put bringing her lunch, brushing her teeth and hair and packing her agenda. These items are easily forgotten in our home. 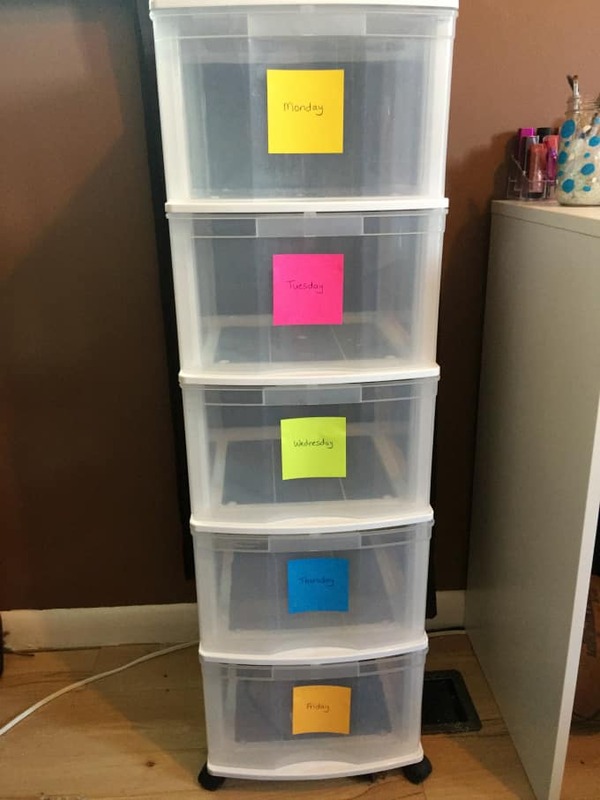 You could put whatever items on your list that your child struggles with. How many times have you heard your child say they have nothing to wear? Probably, quite a lot. This easy hack will save your sanity and can be easily done on Sunday night before the start of the school week. 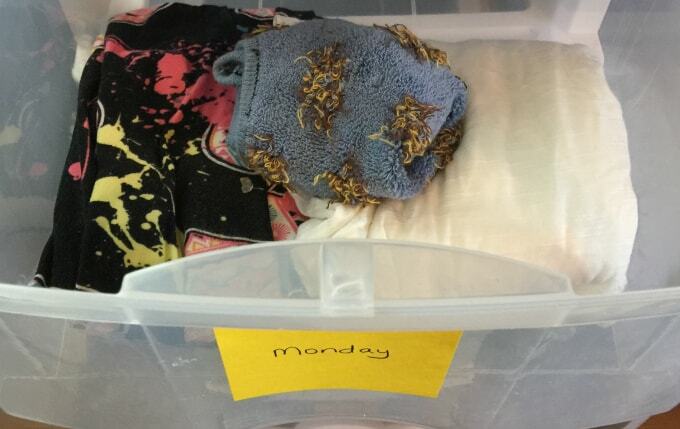 If you’re kids are older, let them choose their outfits for the week. 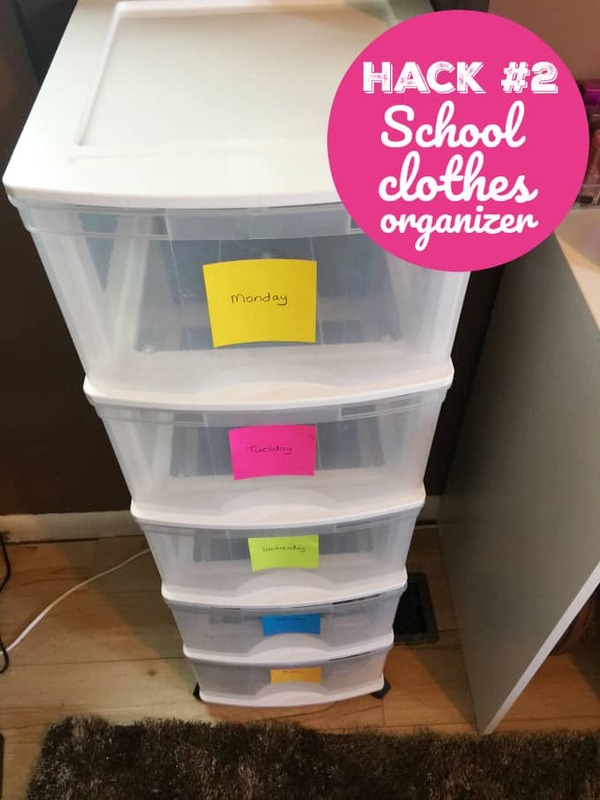 This School Clothes Organizer can be easily assembled with a five-drawer storage tower and a pack of Post-it® Notes! 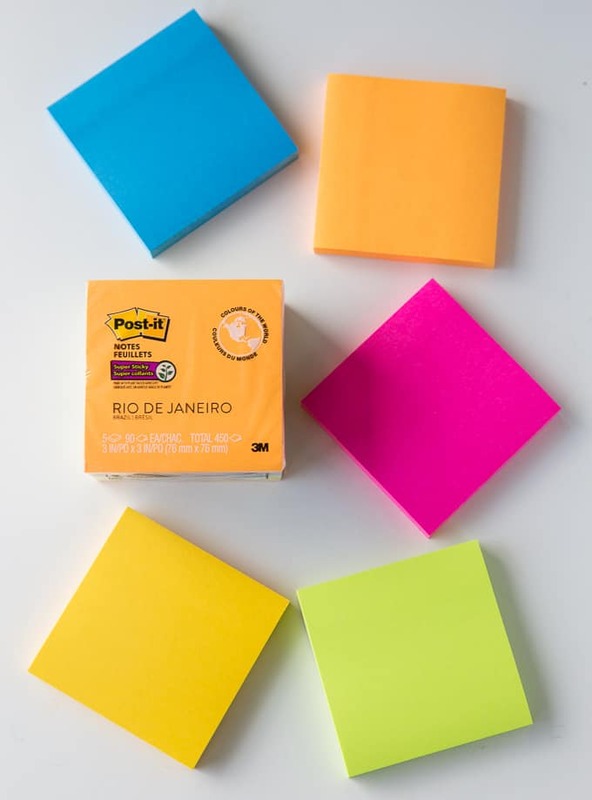 I used the multi-purpose colourful Rio De Janeiro Post-it® Notes for mine. I like this package because it has five different colours that I can use for each day of the week. 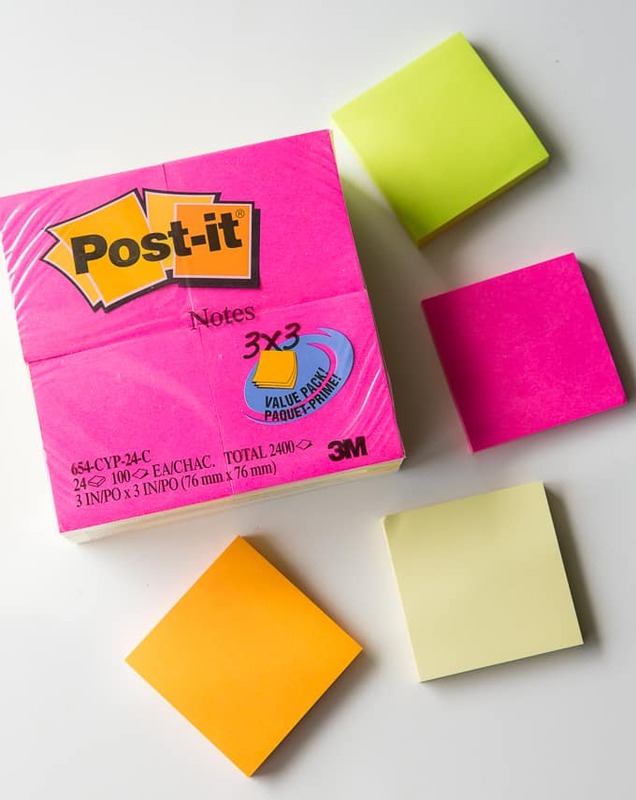 Any kind of Post-it® Notes will work so use what you have already on hand. 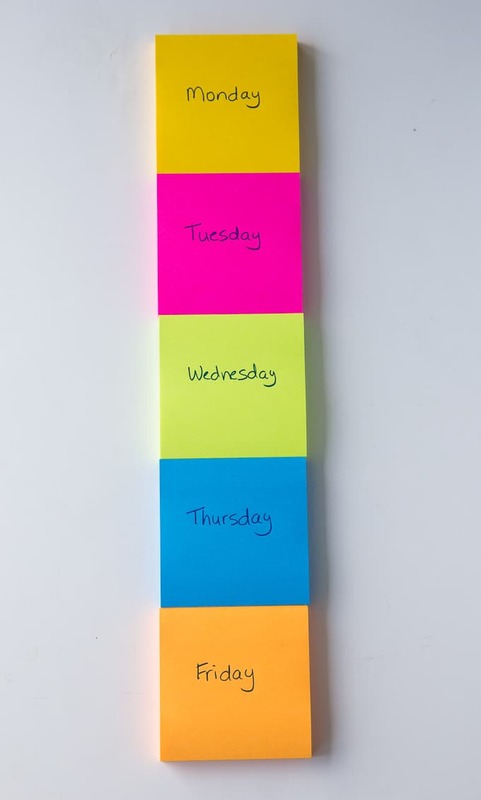 Simply write each day of the week on your Post-it® Note. You could use the same colour and keep it monochromatic or brighten it up by using a different colour for each day of the week. 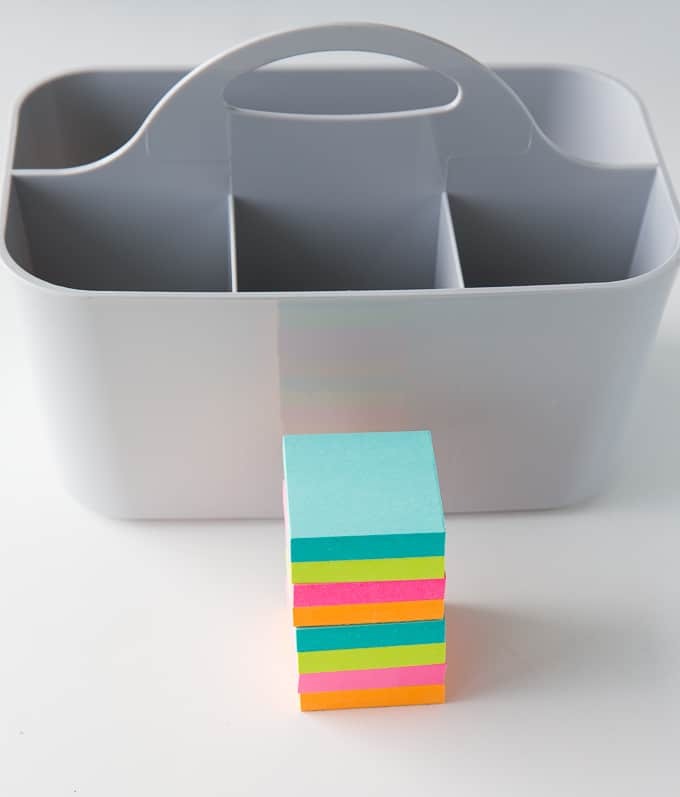 Place your Post-it® Notes on the outside of each drawer and that’s it! Add an outfit for each day of the week so there’s one less decision to be made on hectic mornings. Once you get your child out of bed, the battle begins. I’m constantly having to coax Bridget to do the simplest of tasks. Brush your teeth, Bridget. Did you brush your hair, Bridget? What about washing your face? I’m like a broken record sometimes, but if I don’t do it, she won’t either! 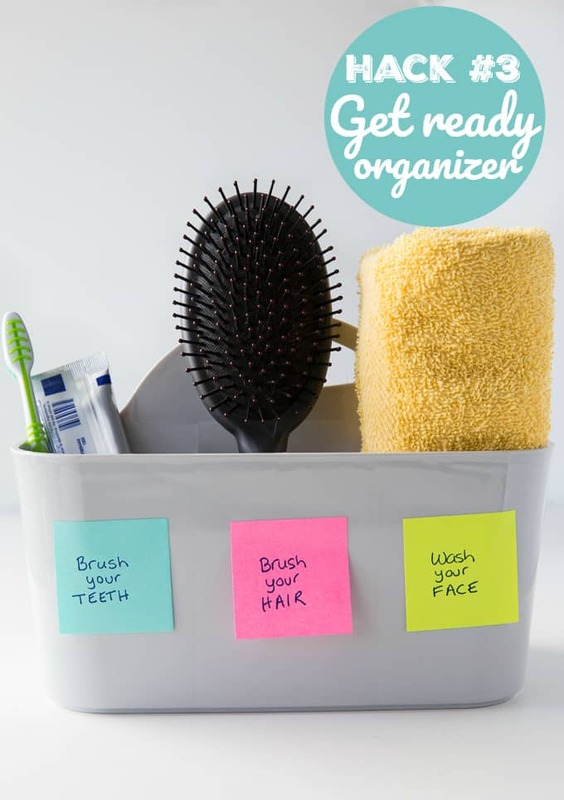 A Get Ready Organizer is the solution. 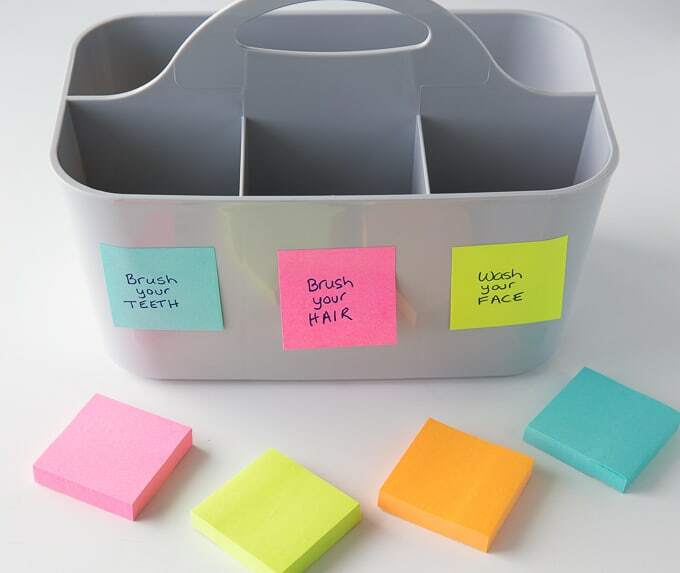 Take a small bathroom caddy and label it with a Post-it® Note with each compartment representing a different morning task. I used Miami Colour Collection from Post-it® Brand for this project. I liked them because they are smaller to fit the bathroom caddy and bright to stand out. My caddy has four compartments so I made each one a different task including brushing teeth and hair and washing her face. Then, place the necessary products in each caddy and store it on your bathroom countertop to make it easily accessible. The goal is to keep your child on track and focused on what he or she needs to do to get ready each day. As you can see, these are simple, yet effective ways to make mornings run smoother. You don’t have to spend a fortune on gadgets or planners. 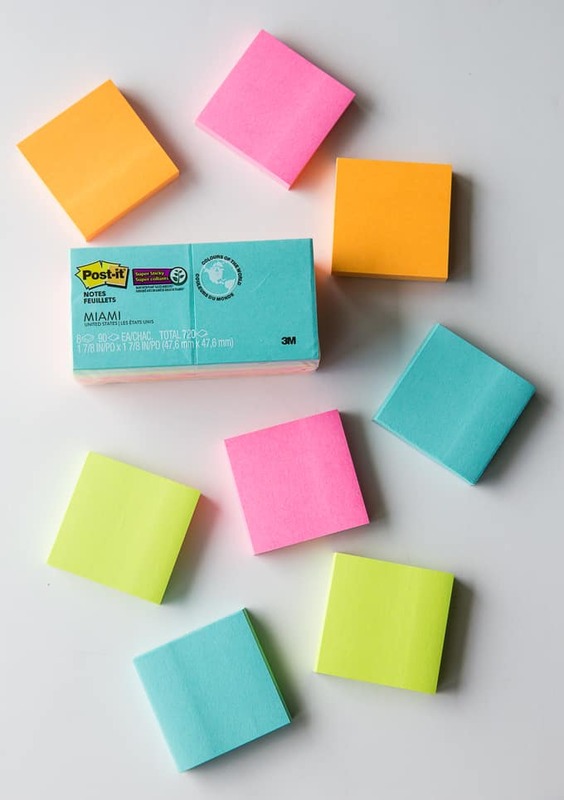 Just a few Post-it® Notes and other easy-to-find supplies and you are good to go! They are an essential part of our back to school toolbox and help keep our family on track. I visited our local Staples to pick up everything I needed for back to school. I love that they carry everything I need to make the transition as stress-free as possible. You can also shop online at Staples or through their Staples mobile app. For more creative ideas for back to school and beyond, check out the Inspiration That Sticks blog. I’d love to hear about your back to school tips. What are you doing to make your mornings as stress-free as possible? Disclosure: I am proud to be a 3M sponsored blogger, and as part of my responsibilities, I get the opportunity to evaluate 3M products. We always make lunches the night before. I also have my coffee programmed to come on so It’s ready when I get up. That divided basket is a great idea, all the supplies ready to use and put back into the divided carrying tote, no excuses for messy bathroom countertop. keep everything ready the night before. To make my mornings as stress-free as possible I clean up the kitchen and put stuff away the night before. It stresses me out to wake up to a messy kitchen. I am always trying to get ahead in the morning…pre pack lunches and putting on music (no tv) to get us moving. I’m getting everything ready the night before, especially lunches and outfits! I work in the mornings so I leave it to my husband to get the kids off to school. He is much more patient then me. My kids get their own lunches ready.